The first generation Lenovo IdeaTab Miix 10 was a decent, albeit not overly impressive Windows tablet, which mainly stood out because of the included keyboard folio. The new Miix 2 10 is not just a subtle update of the predecessor: in addition to a current-generation Bay Trail Atom processor and a significantly higher-resolution display, the Miix 2 10 makes use of a magnetic latch system to secure the tablet portion to the included keyboard dock in a fixed position - a quite interesting take on the more traditional hybrid tablet-concept with a detachable keyboard like the Asus Transformer Book T100TA-C1-GR Convertible. Of course, there are also hybrids which have the keyboards attached at all times, like Lenovo's own IdeaPad Yoga 2 11 Convertible. 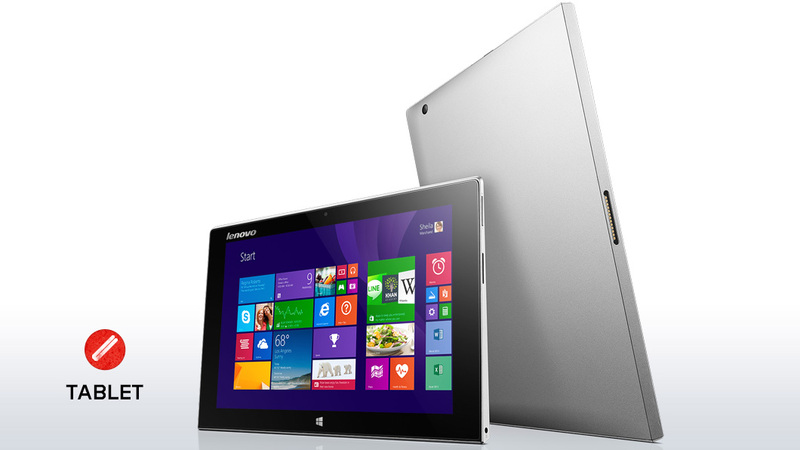 The Yoga is more powerful, features a slightly larger display, but is also heavier and bulkier. At the time of writing, Lenovo offers a version of the Miix 2 10 with 64 GB of eMMC storage for $500; our review model costs $100 more and ships with 128 GB flash instead. 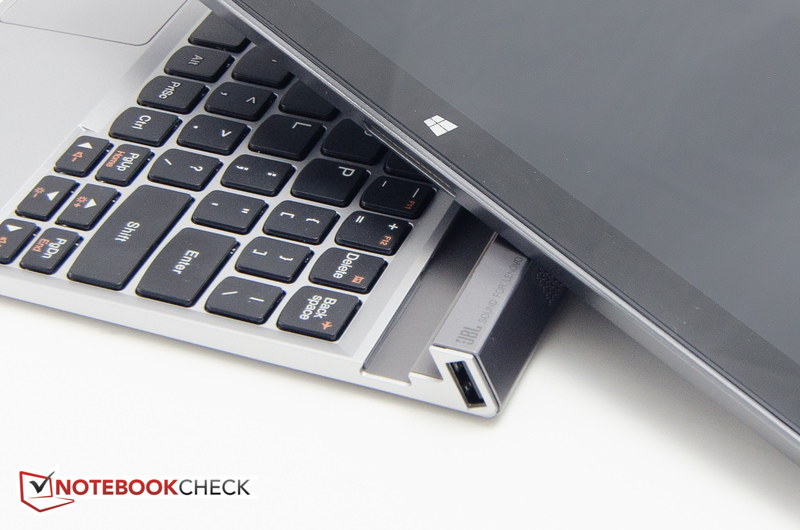 Even without its dock, the design of Miix 2 10 differs from most competitors. Lenovo decided to forgo the smoothly rounded corners of tablets like the Asus Transformer Book T100TA-C1-GR in favor of sleek, angular lines reminiscent of an Ultrabook. The top and bottom edge of the wedge-shaped slate, which is designed to be primarily operated in landscape mode, are beveled; the rear panel and the sides are different types of silver-colored plastic. The tablet portion of the Miix 2 10 weighs in at 620g; the keyboard dock adds another 440g. 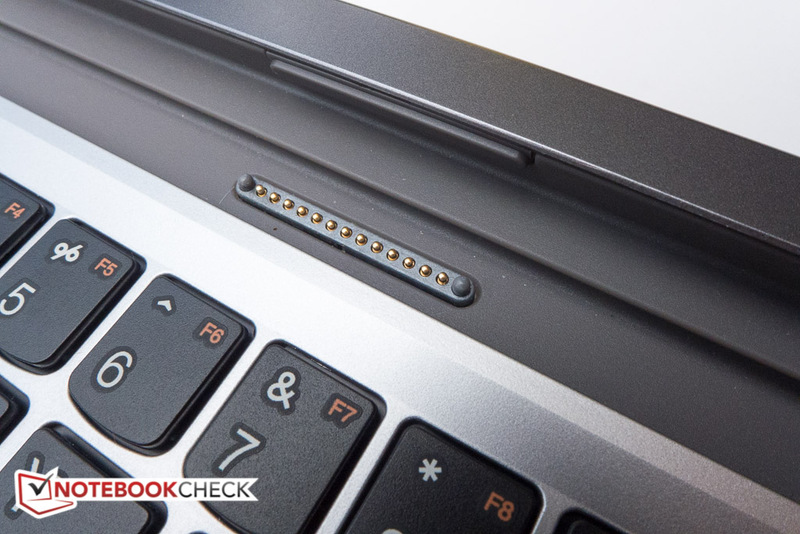 The tablet attaches via hidden magnets to the keyboard dock, which is made from silver plastic as well. 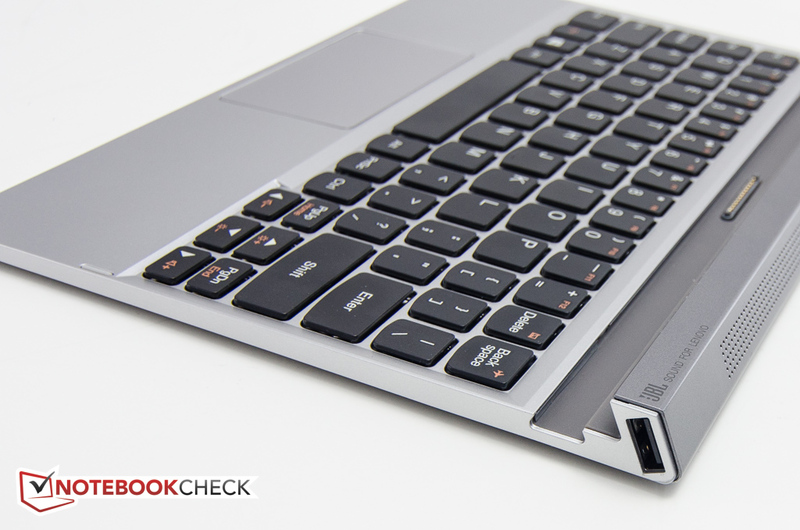 The keyboard dock features a full-sized USB 2.0 port on each end and a backwards-facing subwoofer. An additional dock battery is unfortunately not included, nor an option. The build quality is decent, although we noticed that when the tablet is inserted in the dock, the two components don't quite line up perfectly. The tablet is reasonably rigid, but emits creaking sounds when twisted; the dock flexes very easily and bends when pressure is applied. The magnets allow the Miix 2 10 to be set up in three different positions. 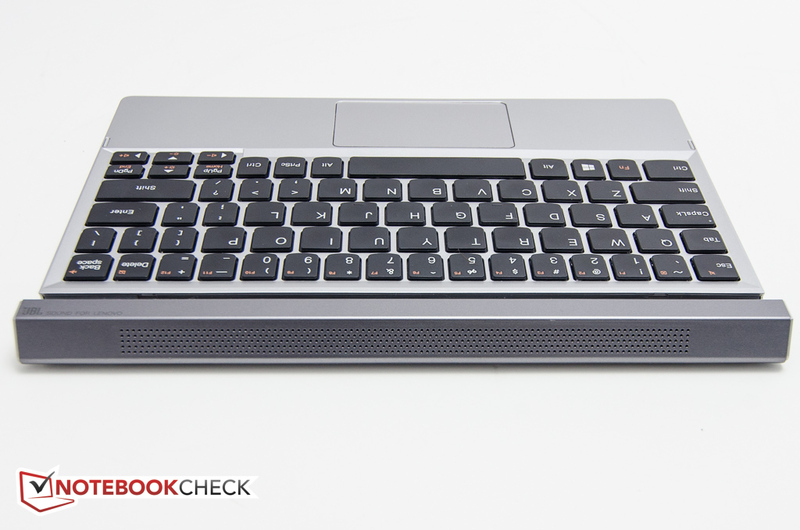 When closed, the tablet snaps in facing the keyboard and the assembly looks much like a closed clamshell subnotebook. We were a little skeptical at first, but the two sections attach to each other fairly securely, so even when tossing the Miix 2 10 into a bag or handling it somewhat roughly, the two halves did not come apart. We would still recommend to exercise caution when handling the assembly, however. 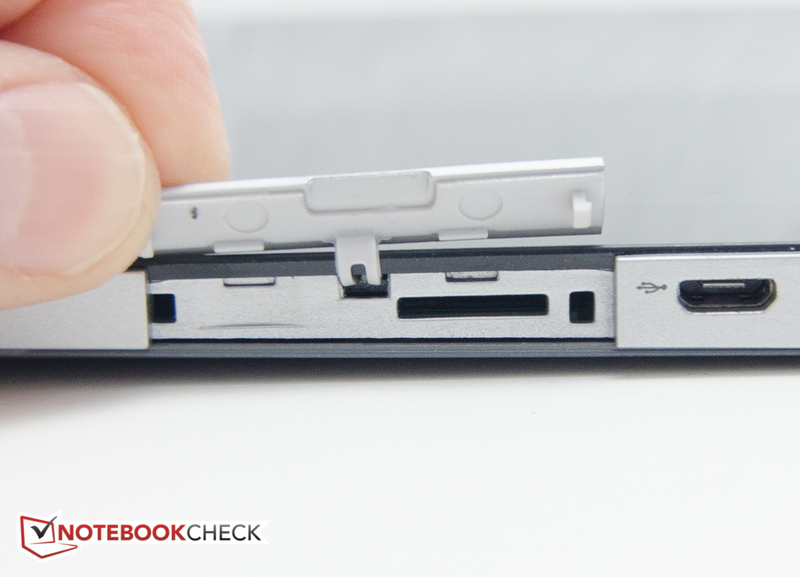 In the open position, which Lenovo calls Laptop mode, the Miix 2 10 again looks much like subnotebook - so much so that we sometimes inadvertently tried to adjust the display angle while working on it, which of course is not possible. The angle of the tablet (115 degrees) is actually less than ideal in our opinion, but probably a necessary design choice to prevent the assembly from tipping over. A different slot in the dock allows the keyboard to act as a stand. In this case, the subwoofer now faces the user for an enhanced multimedia experience. 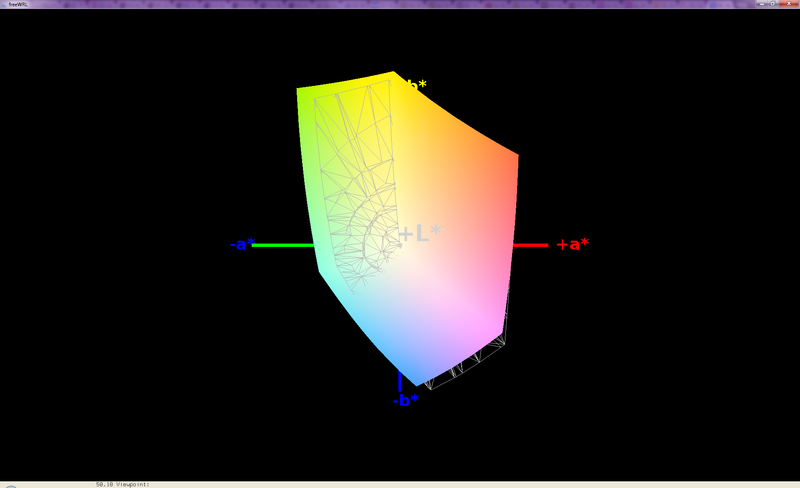 When working with the tablet on its own, we found the angular design to be somewhat of a drawback. The tablet is easy to hold in landscape mode, but in portrait mode, the sharp edges dig into the hand holding it, which makes longer hand-held sessions quite uncomfortable. Unlike the Transformer Book T100TA-C1-GR and most smaller 8-inch tablets, the Miix 2 10 includes a dedicated power adapter. 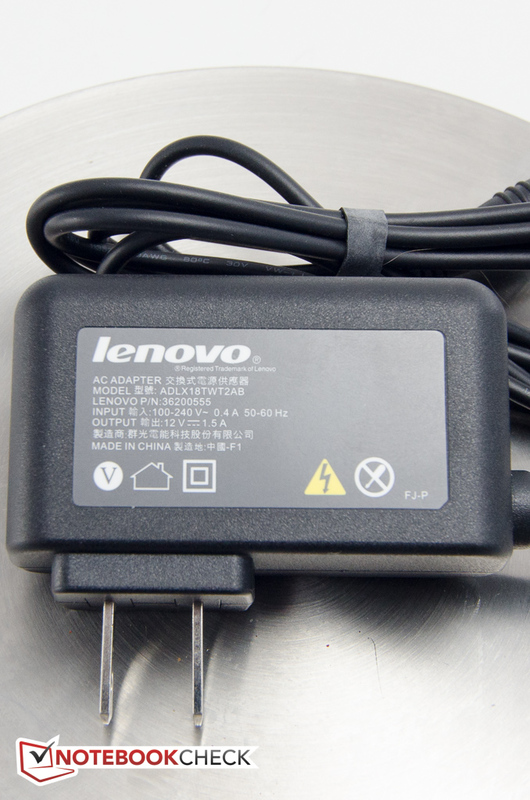 This means that the Micro-USB port is available for other devices even when the tablet is charging. 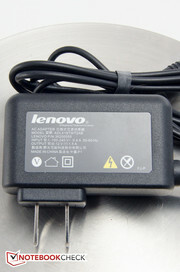 Although not advertised, the tabled can be charged through the Micro-USB port as well. The tablet also features a MicroHDMI port for output to an external monitor or TV, while the dock is home to a full-sized USB ports on each end. A MicroSD card slot allows the user to expand the storage easily. According to Lenovo's specs, only cards up to 32 GB war supported, although we expect 64 GB cards to work as well (not tested). The WLAN module (802.11a/b/g/n) is courtesy of Broadcom. During our time with the Miix 2 10, we didn't have any issues with establishing connectivity or unusual dropouts, although the signal strength seems to drop off fairly quickly farther away from the router. Bluetooth 4.0 is also on board for connectivity to external mice and other devices. In addition to the OS (Windows 8.1 32-bit), Lenovo ships the tablet with a full version of Office Home & Student 2013 as well as Lenovo Cloud Storage, Evernote, VeriFace face recognition, and a 30 day trial of McAfee Internet Security. Included are the power adapter, the keyboard dock, and various pamphlets. 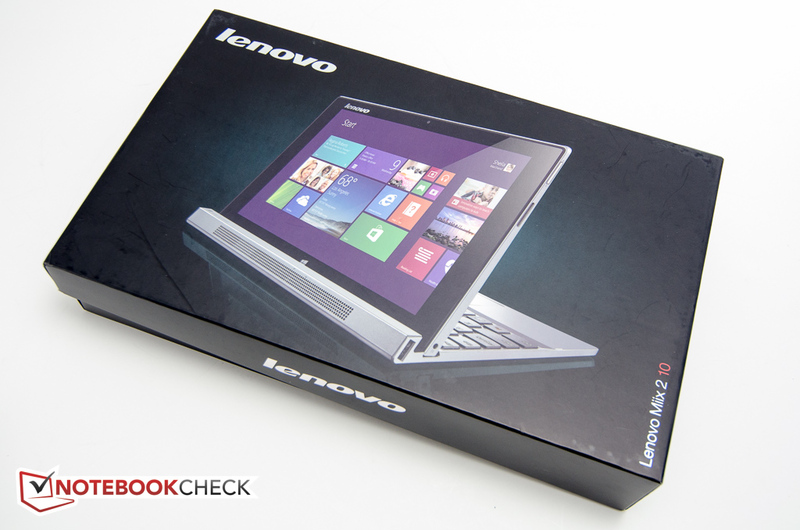 Online, Lenovo also sells a Folio Case for the tablet and the dock as well as a screen protector. 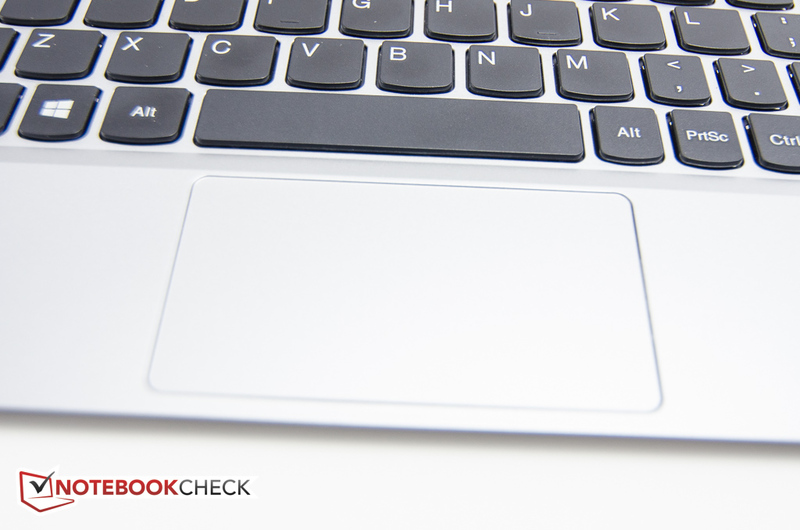 The Miix 2 10 carries a standard 12-month warranty against manufacturer's defects. 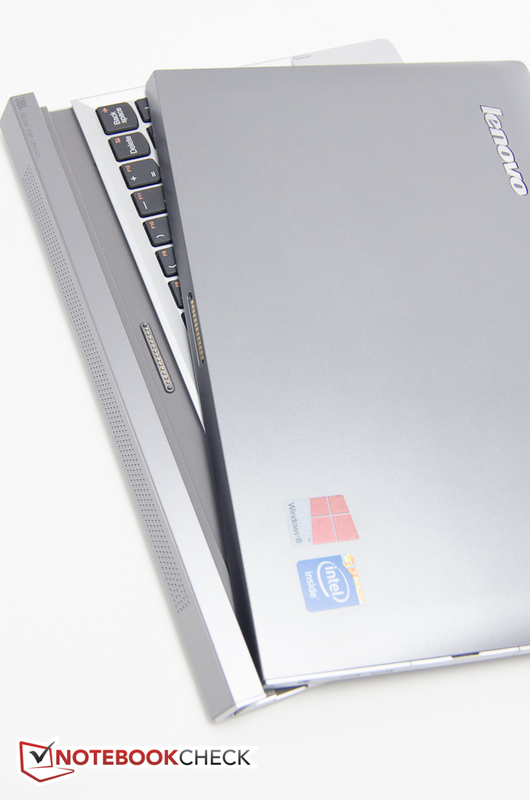 Lenovo offers warranties up to 36 months with Accidental Damage Protection (+ $199). The front-facing camera is designed for video conferencing and features a resolution of 2 megapixel (1920 x 1080 pixels). The quality is OK for the intended purpose, although low-light conditions resulted in a pretty grainy picture. 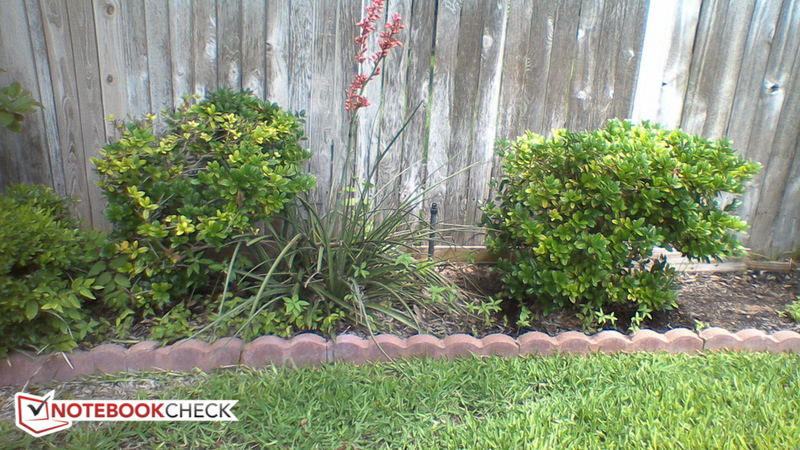 The rear-facing camera has 5 megapixel and captures images at a resolution of 2560 x 1920 pixels. Color accuracy and overall quality are a bit better, but the camera also doesn't deal that well with low-light conditions. Unlike the business-oriented Dell Venue 11 Pro and some of Lenovo's own Thinkpad tablets, the 10-finger touchscreen does not come with an active digitizer, so input is only possible using the fingers or a capacitive stylus (not included). A stylus could potentially make the operation of the high-resolution screen (1920 x 1200 pixels) easier, since icons and buttons are very small indeed, despite the default scaling of 125 %. Another potential drawback of the high resolution: some older apps do not scale well under Windows 8.1. 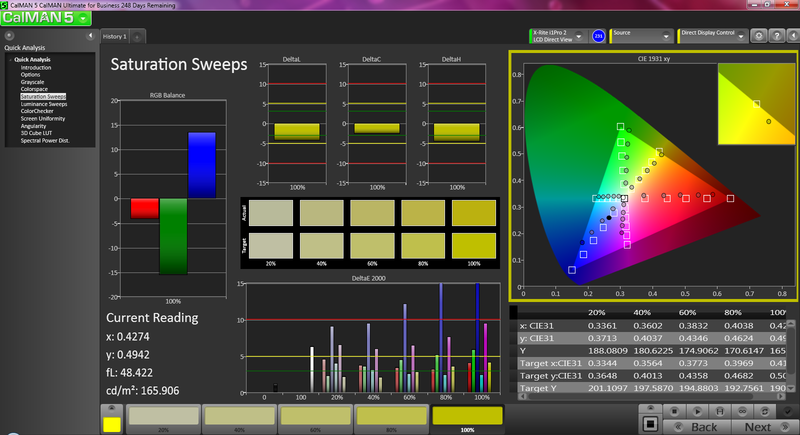 Inputs and various swipes are recognized reliably and translated quickly, however. 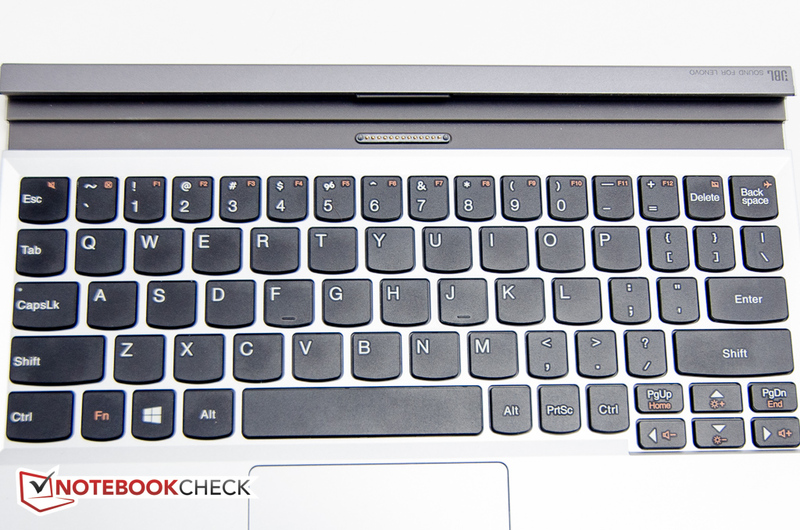 Instead of focusing on the well-know Windows 8.1 virtual keyboard, which does its job as expected, we'll take a closer look at the included keyboard dock. Since the keyboard is the same size as the tablet, it shouldn't come as a surprise that it feels a bit cramped. 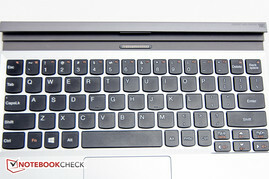 Some of the key placements definitely require getting used to: the Delete and Backspace keys are right next to each other and the same size as the other keys; the ~ is located above the letter Q in the same spot the number 1 would normally occupy, Since the keyboard tray is quite flexible and the key travel is short, the feedback is not quite as crisp as we would like it to be. Still, this input method is far superior to using the virtual keyboard and after some practice time, we were able to type reasonably fast. 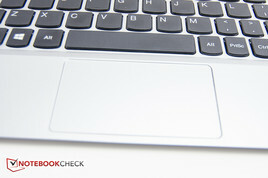 The clickpad is quite tiny (8 x 4.5 cm), but generally works well. Clicks are only recognized in the lower section of the pad and gestures are unfortunately not supported, so pinch-to-zoom or two-finger scrolling are out of the question. 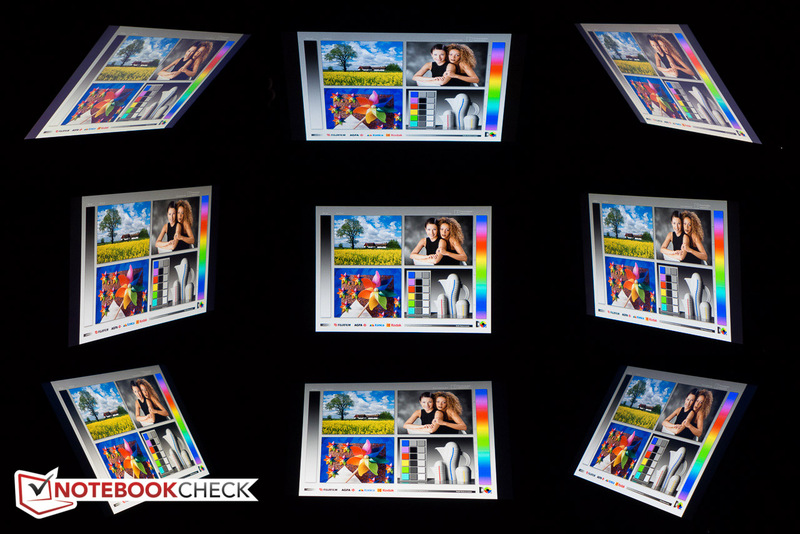 The glossy 10.1-inch display from AOU (B101UAN01.7) has a resolution of 1920 x 1200 pixels (16:10 aspect ratio) and uses IPS technology. The screen is protected by a glass panel and features a pretty wide black bezel, which makes it look slightly smaller than it is. 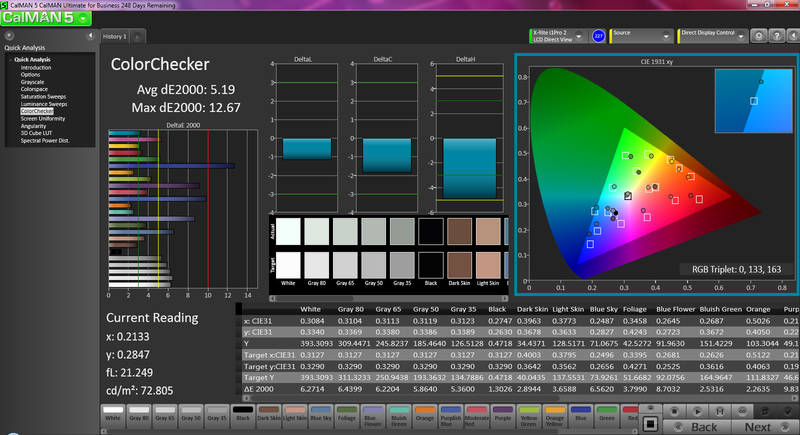 While the resolution is impressive, the black value of 0.749 cd/m² and the contrast ratio of 515:1 are less so. The Asus Transformer Book T100TA-C1-GR has twice the contrast; the Dell Venue 11 Pro also achieves a significantly higher ratio of 900:1. 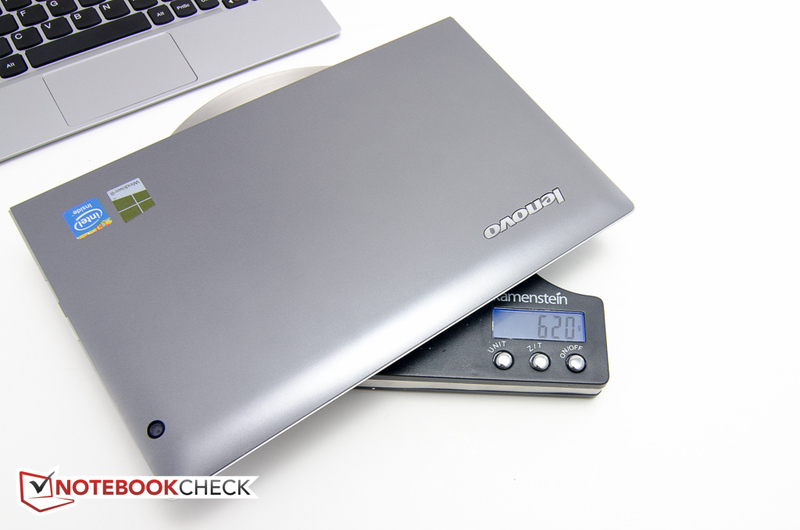 With an average brightness of about 370 nits measured across 9 quadrants, the Miix 2 10 is significantly brighter than the Transformer Book (240 nits) and on par with the Venue 11 Pro. Asus' own Android-based Transformer Pad Infinity TF700T, which has the same size screen and the same resolution, outshines the competition with 540 nits. 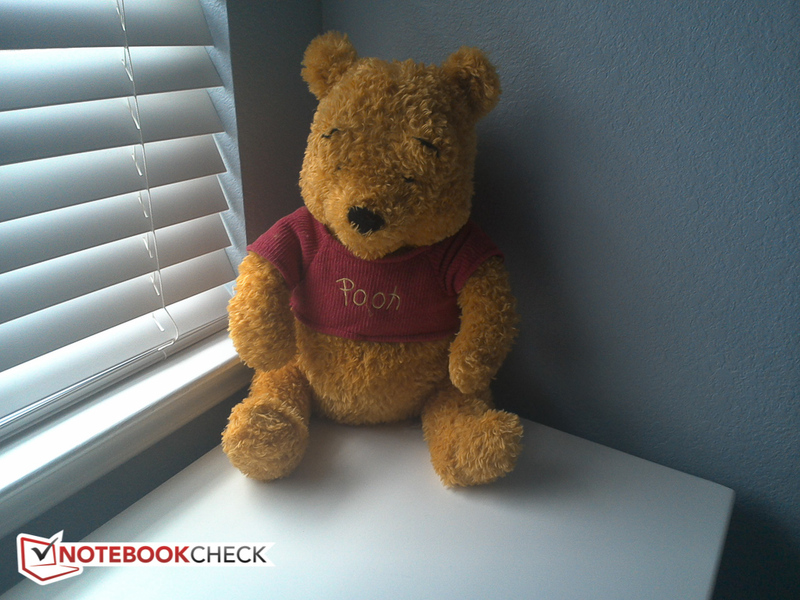 Unfortunately, the brightness decreases to 325 nits when the tablet is running on battery power. The professional color spaces sRGB and AdobeRGB are only covered to about 59 % and 43 %, respectively. This is not really a problem, since the Miix 2 10 is not at all suited for professional photo and video editing due to its size and performance. 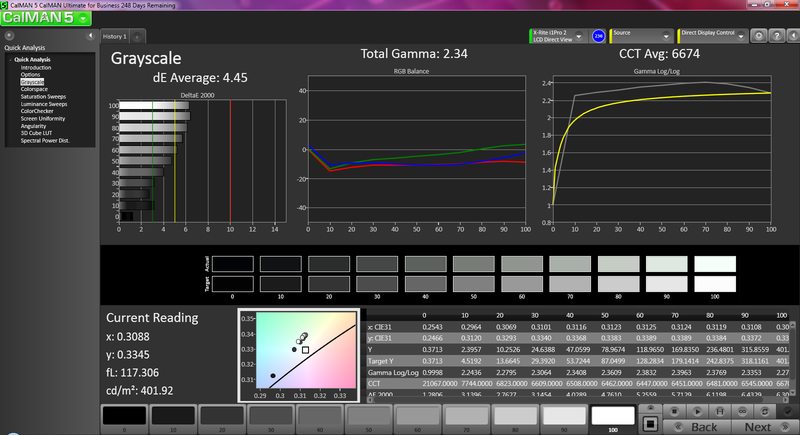 Our analysis with the X-rite i1 Pro Basic 2 spectrophotometer and the software CalMAN 5 shows average DeltaE deviations of 5.2 and 4.7 for color and grayscale, respectively - a very good result for this class. The color temperature of around 6700 is also close enough to the ideal of 6500 K. The bluish cast we so frequently encounter is more or less absent, although both magenta and especially blue show high DeltaE values at higher saturation levels. Outdoor usability is just OK due to the decent brightness of the highly glossy display panel. 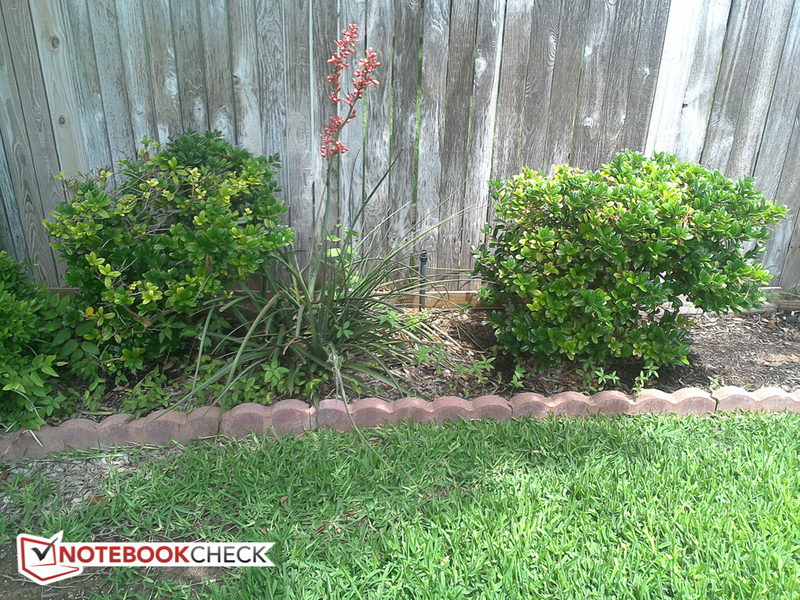 Working with the Miix 2 10 in direct sunlight is difficult at best, although working in the shade is possible. The fixed angle of the display when the Miix is propped up in the keyboard dock is once again an issue, as we were frequently tempted to tilt the screen to reduce the glare. The viewing angle stability of the IPS panel is very good. Lenovo promises "nearly 180-degree viewing angles" - and the screen content indeed does look good from just about any angle - better than the attached image would indicate. This is particularly important since the fixed-angle design of the Miix 2 10 in Laptop Mode prevents tilting the display back for a head-on view of the screen. A TN panel would probably suffer from pictured degradation in this case. 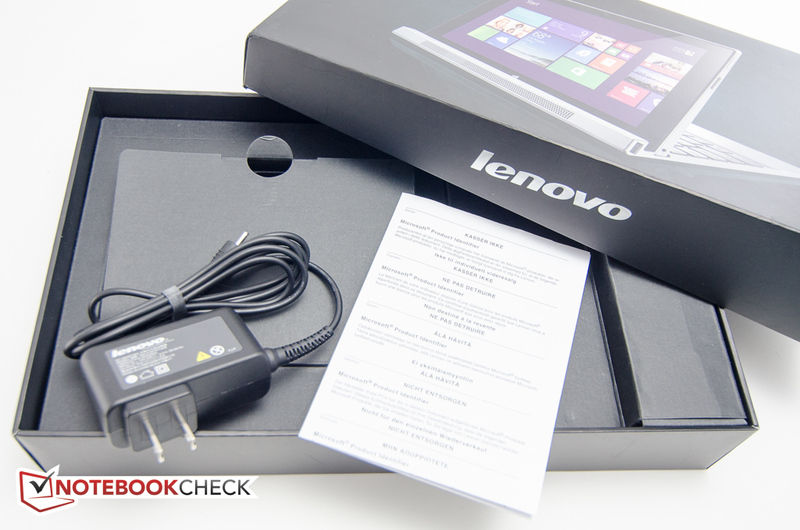 At the time of writing, Lenovo only offers two versions of the Miix 2 10. The only difference is the amount of eMMC flash storage: our review model features 128 GB and sells for $600; the version with 64 GB sells for $500. We would only recommend the 64 GB version to users who do not plan on installing a lot of programs. The Intel Atom Z3740D is a quad-core SoC with a base clock speed of 1.33 and a Turbo-maximum of 1.83 GHz. The most noteworthy feature of the Bay Trail-T-series processor is the extremely low power consumption of less than 4 watts. Performance per MHz has increased significantly compared to the previous generation: with scores of 968 and 3326 points for the Cinebench R10 Single and Multi benchmark test, the Z3740D easily outperforms the Atom Z2760 installed in the predecessor Miix 10 (609 / 1711 points). The scores of the 8-inch Toshiba Encore WT8-A-102 and the Asus Transformer Book T100TA-C1-GR - both equipped with almost identical Intel Atom Z3740 (the Z3740 features a dual-channel memory controller, the Z3740D does not) - are within a few percentage points of our review tablet. The Dell Venue 11 Pro with its much more powerful, but also less frugal dual-core Intel Core i3-4020Y scores significantly higher (CB10 Single: + 170 %, CB10 Multi: + 41 %). 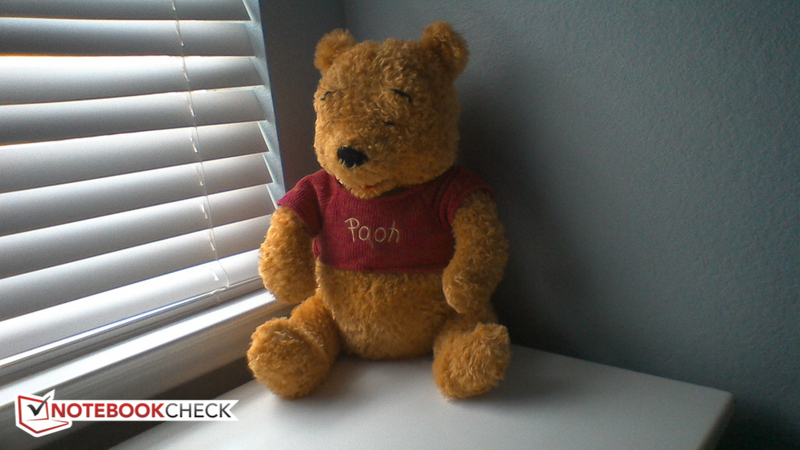 We use the PCMark 7 benchmark test to gauge overall system performance. The Miix 2 10 received 2342 points, trailing the Toshiba Encore WT8-A-102 (2497 points; +7 % ) slightly. 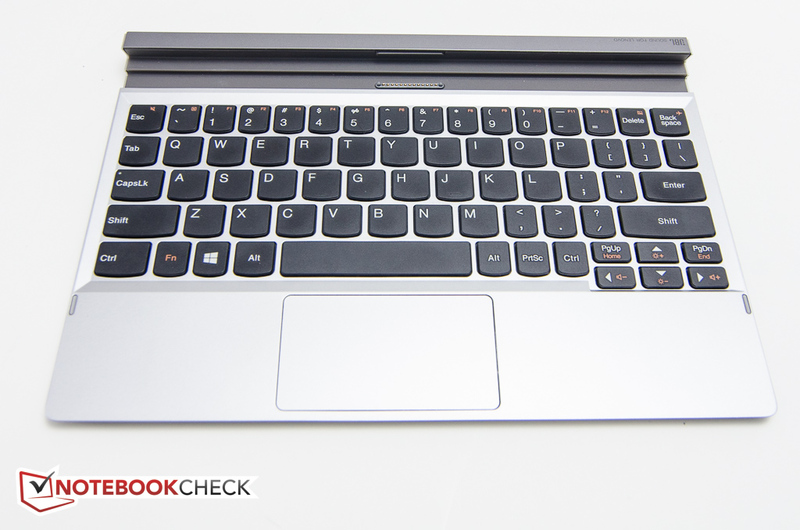 The score of the Asus Transformer Book T100TA-C1-GR (2339 points) is almost identical to our review tablet. A test with the Miix running on battery power yielded a score within a percentage point of the original one, so full power is also available away from the outlet. Subjectively, the Miix 2 10 offers decent performance and the tablet handles many daily tasks without significant delays. 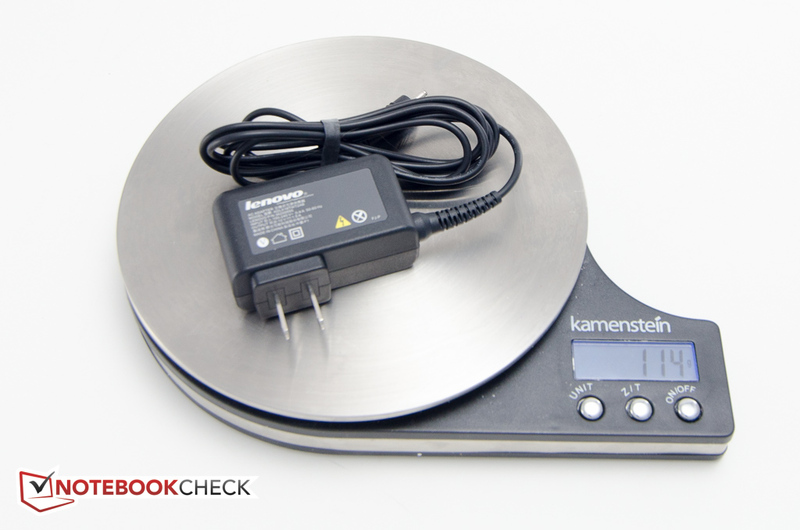 Coming from a system with a true 2.5-inch or mSATA SSD will require an adjustment period, as opening programs might require an extra second or two. With an average transfer rate of 66 MB/s according to HD Tune, the eMMC flash drive is slower than even 5400 RPM platter-based hard drives. CrystalDiskMark confirms the result with sequential read and write speeds of about 75 and 32 MB/s, respectively. The tiny 32 GB flash drive installed in the Asus Transformer Book T100TA-C1-GR is quite a bit faster with sequential read and write speeds of 109 and 43 MB/s. 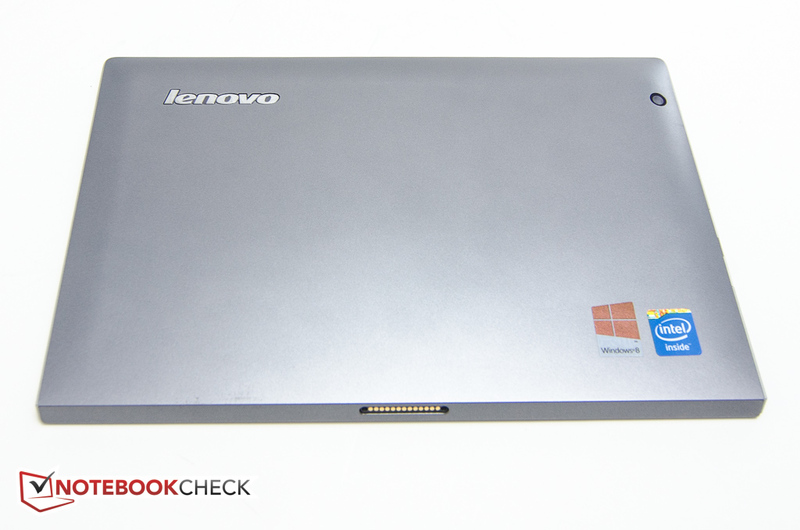 A true SSD like the 128 GB mSATA drive in the Dell Venue 11 Pro is capable of average transfer rates of 325 MB/s. At least the - for the actual performance very important - 4K results as well as the access time of 0.38 ms beat out any conventional hard drive. The integrated Intel HD Graphics (Bay Trail) tops out at a clock speed of 667 MHz. Demanding 3D software is out of the question, but for most tasks, including the playback of Full-HD videos, the GPU offers enough performance. Intel's Quick Sync Video is supported as well. 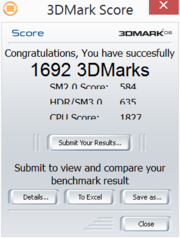 The result of 1692 points for the 3DMark 06 benchmark test quadruples that of the PowerVR SGX545 GPU in the predecessor Lenovo IdeaTab Miix 100 (421 points). The HD Graphics integrated in the Atom Z3740 in both the Asus Transformer Book T100TA-C1-GR and the Toshiba Encore WT8-A-102 is about 10 % faster. 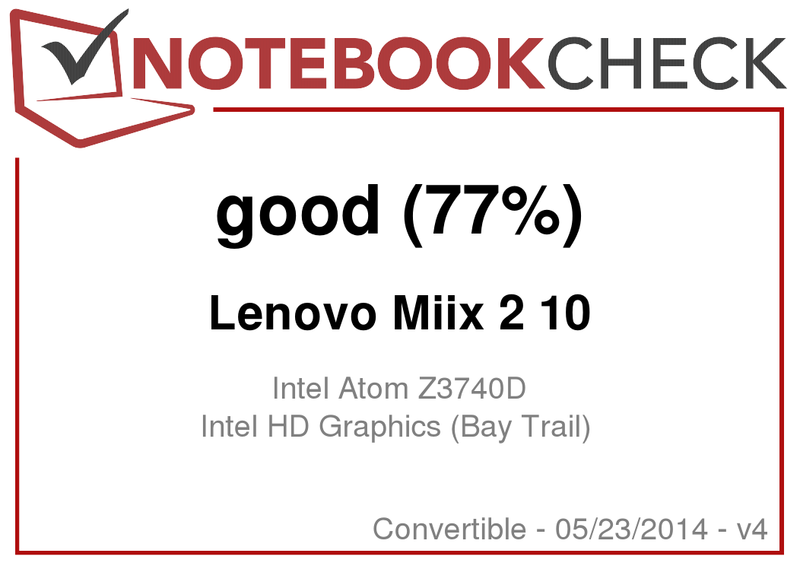 The Intel HD Graphics 4200 in the Dell Venue 11 Pro offers more than double the performance (3DMark 11 score of 509 points vs. 215 points for the Miix 2 10). While the tablet will have no issues with various online games, current games are more or less out of the question. Even Fifa 14, which is known to have very low resource requirements, is only playable at the lowest setting. 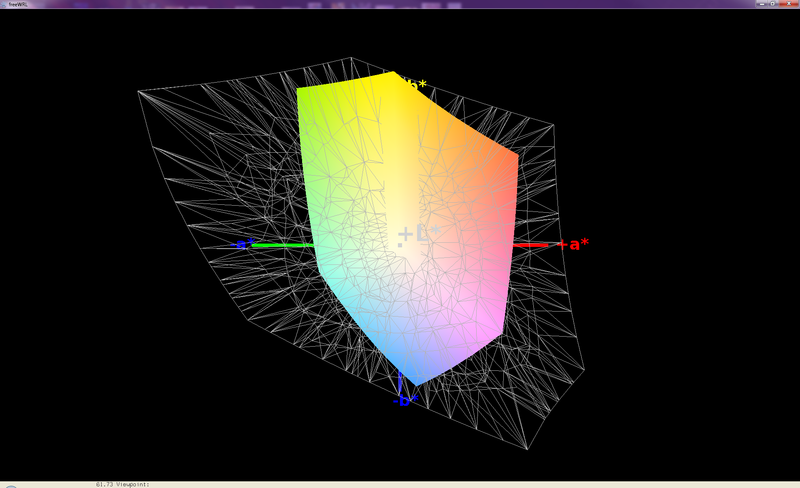 At a resolution of 1366 x 768 pixels and the medium preset, the frame rate already dropped to about 19 fps. The Miix 2 10 does get quite warm. Even during idle, we recorded temperatures of up to 36 degrees C on the back, which is quite a bit warmer than the Transformer Pad, which topped out at 30 degrees C. The predecessor Miix 10 reached 34 degrees C. Under load, the tablet reached 43 degrees C right in the area where the left hand rests when holding the tablet in landscape mode. This is about 1 degree C warmer than the predecessor, but remains below the maximum of the Transformer Pad (45 degrees C). During the stress test, we try to identify temperature related problems such as throttling. With just Prime95 running, the CPU initially started out at 1.86 GHz but dropped to between 1.3 and 1.6 GHz after 5 minutes. After a total of 10 minutes, the CPU cores remained at 1.3 GHz, while the temperature stabilized at 78 degrees C. With just Furmark active, the GPU reached 533 MHz at a temperature of just under 80 degrees C. Under maximum load (Prime95 and FurMark running in parallel for several hours), we saw a drop of the CPU speed to 300 MHz with occasional jumps of one or the other core to 1.3 GHz. The GPU reached a maximum of 311 MHz. The temperature was once again just under 80 degrees. It appears that the tablet does have some heat-related issues: a subsequent test with PCMark 11 revealed a noticeable drop in performance of around 18 %. Under normal conditions such drops are going to be highly unlikely, however. (±) In idle usage, the average temperature for the upper side is 32.3 °C / 90 F, compared to the device average of 30.3 °C / 87 F.
The JBL-branded stereo speakers, which are housed on the left and right side of the tablet, are supplemented by the subwoofer when the Miix is inserted in the keyboard dock. The sound is extremely tinny when the tablet is used on its own; even with the subwoofer in action, the sound is still lacking in our opinion, although noticeably improved. We definitely recommend an external speaker solution or headphones for those wanting better quality. 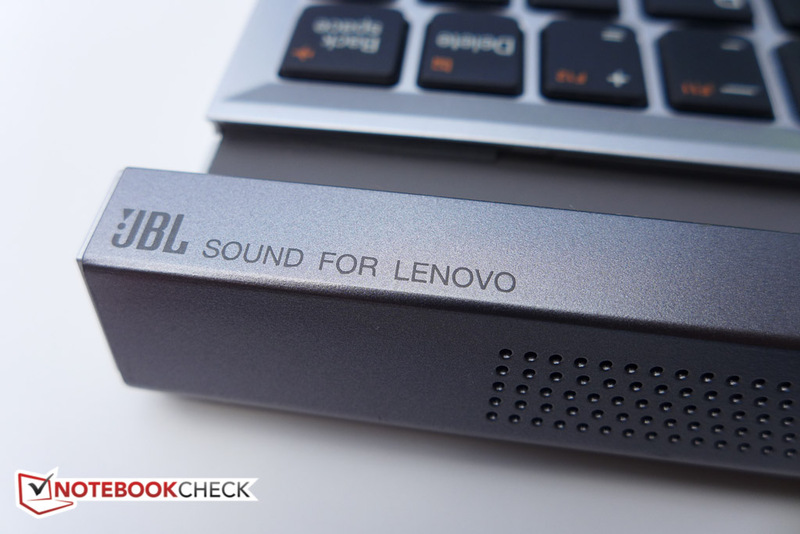 For watching movies and the YouTube-videos, the sound quality is sufficient. With the screen brightness turned to the lowest setting and wireless off, we established a maximum run time of 7 hours and 41 minutes with the tablet attached to the keyboard dock. On its own, the tablet lasted about 8 hours and 30 minutes. To simulate a more real-world scenario, we use our WLAN test with the brightness set to about 150 nits, while a script browses various websites every 40 seconds. The Miix 2 10 quit after 5 hours and 45 minutes, which is a 5 full hours shorter than the Asus Transformer Book T100TA-C1-GR. 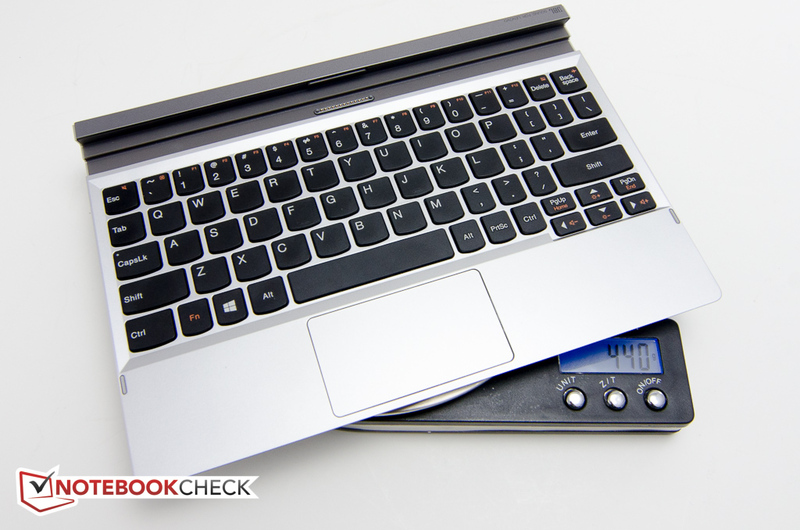 Even though the Transformer Book has the larger battery (31 Wh vs. 25 Wh), we are still a bit bewildered that the Miix 2 10 shut down that much sooner. The 8-inch Toshiba Encore WT8-A-102 (19.5 Wh battery) lasted a little over 7 hours. Under maximum load, the tablet lasted for about 3 hours and 45 minutes. The battery run time results are not exceptional, but probably sufficient for most users. What makes the Lenovo Miix 2 10 an interesting choice among Windows 8 tablets is without a doubt the included magnetic keyboard dock, which makes switching between the Laptop and the Stand mode a cinch, and the high-resolution IPS display. For transport, the tablet attaches to the keyboard with the display facing down and can be carried much like a subnotebook. 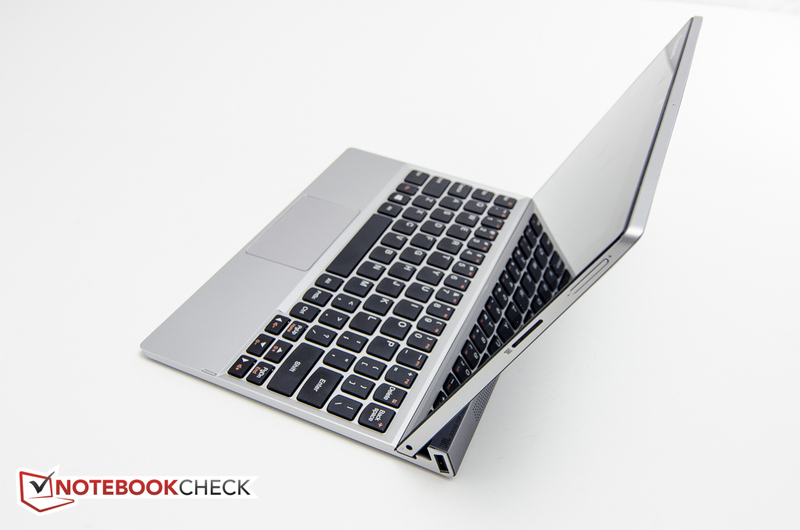 The wedge-shaped design looks good, but is unfortunately not that comfortable to hold for extended periods of time The keyboard dock flexes too much and suffers from an unusual layout, although typing is possible at reasonably fast speeds. Inserting the tablet into its dock is very easy and we do appreciate the two full-sized USB 2.0 ports as well, although it would be nice to have at least one USB 3.0 port. The Asus Transformer Book T100TA-C1-GR has a much lower-resolution screen (1366 x 768), offers about the same performance, but lasts much longer on a charge. It is also substantially less expensive (we found the 64 GB version online for about $370). The Dell Venue 11 Pro offers a larger screen with similar resolution and more robust performance, but also costs more. Users not needing x86 support might want to consider the Android-based Transformer Pad Infinity TF700T, which has the same size screen and the same resolution, but a significantly brighter display. 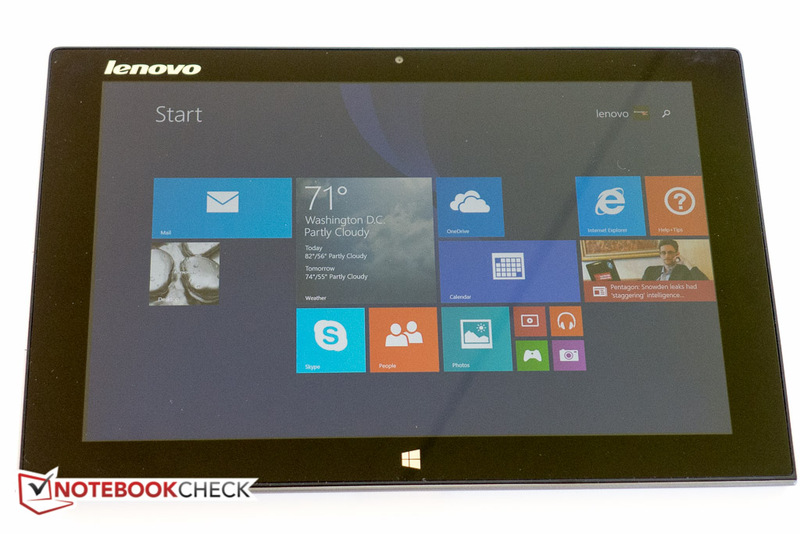 Many manufacturers also offer hybrid tablet devices with keyboards that are permanently attached like Lenovo's IdeaPad Yoga 2 11 Convertible. 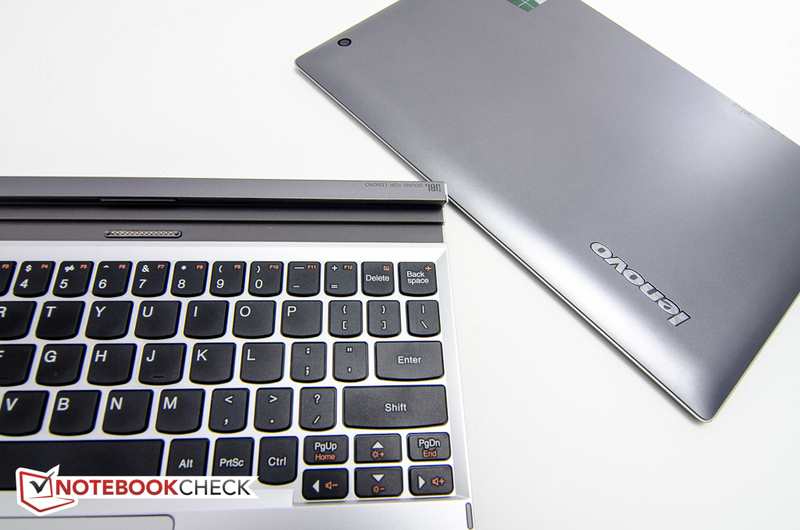 For the utmost in portability, there is always the option of choosing one of the many 8-inch tablets - for example the Toshiba Encore WT8-A-102 - and connecting a small, foldable Bluetooth keyboard to it. The tablet and a keyboard dock. Magnets keep the components together. The dock is unfortunately not very rigid. The front of the dock houses the subwoofer. 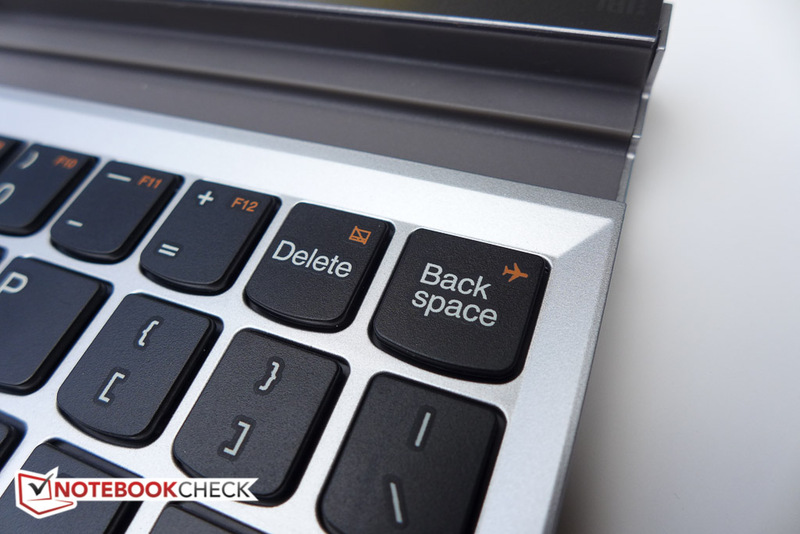 The layout takes getting used to: the Delete and the Backspace key are next to each other and quite small. 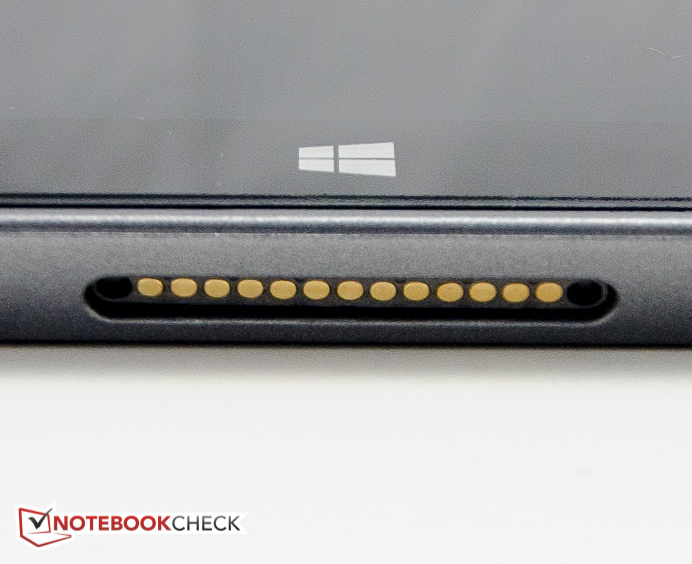 The Micro-SD card slot is hidden under a flap. Unfortunately there's no SIM card option in the US. Not much in the way of accessories. The magnetic keyboard dock and the high-resolution IPS panel. A better battery life and faster flash storage. 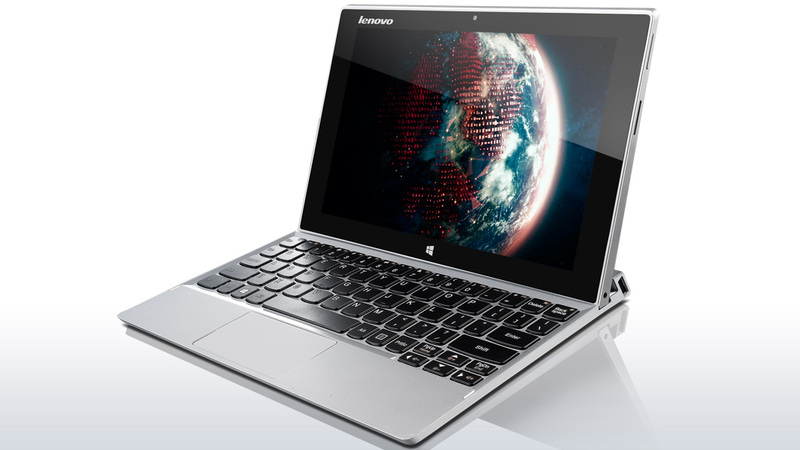 Lenovo keeps on churning out innovative hybrid concepts. 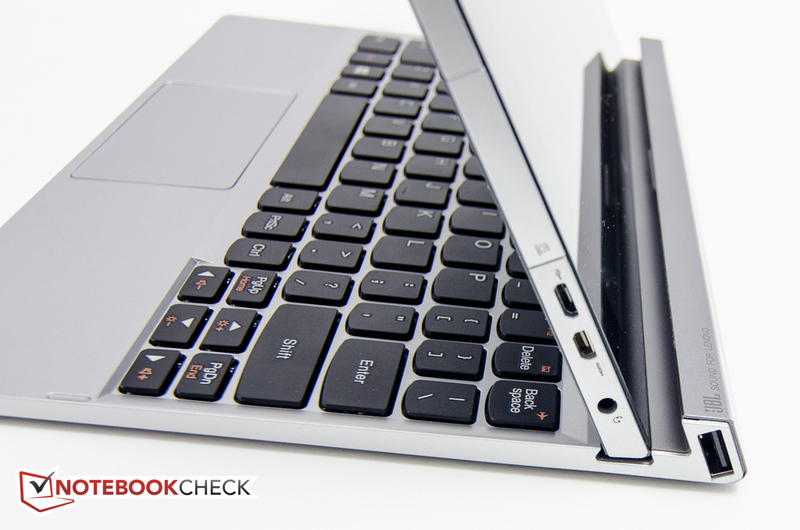 Convertibles with permanently attached keyboards like the HP Pavilion 11-n070eg x360 Convertible or the Lenovo IdeaPad Yoga 2 11 Convertible.